How many times have you gone out to your car on a bitter cold morning, started it, began driving, only for the heat to come on a minute or two from your school or work? For those of us living in cooler climates, this happens all the time. Fundamentally, your heater works by blowing air across a radiator that’s connected to your engine’s coolant system, however that radiator will only give off heat once the flowing coolant gets hot enough. Auto manufacturers are moving towards a new development in engine design that would cut down the time required for a vehicle to get to operating temperature – translating to quicker cabin heat, among other performance benefits. This design, which has already been adopted by some auto makers, takes two traditional parts – the cylinder head & exhaust manifold – and combines them into one dynamic unit. 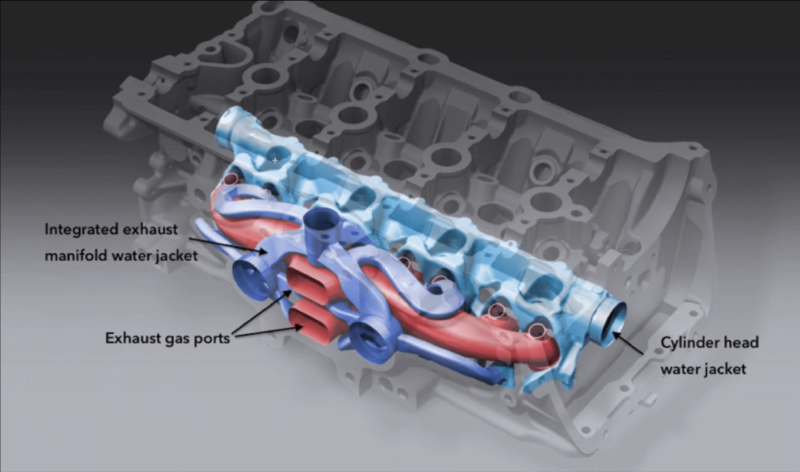 The resulting part is known as an integrated exhaust manifold and it relocates the (previously external) exhaust manifold to the inside of the cylinder-head/engine-assembly. Now located internally, the engine is able to recycle thermal heat from the exhaust gasses, rather than just venting them to the atmosphere. These exceptionally hot exhaust temperatures are absorbed by the engine’s cooling system through ‘sleeves’ (coolant channels around the exhaust ports) and then carried to other parts of the engine, aiding in the engine warming up faster. As much as we’d like to think this was done to reduce our morning shivers, there are still a handful of performance gains when introducing this additional heat exchange. Looking into a cylinder head with integrated exhaust manifolds. In red are the exhaust channels; dark blue are the coolant sleeves. The first and most obvious gain is that a vehicle with shorter cold starts will have less wear on its internals than one that takes longer to reach operating temperatures. Cold temperatures mean thicker oil and poor protection against metal to metal scoring. Additionally, a cold engine requires more fuel to keep from stalling, translating to poor fuel economy during these warm up periods. So in this respect, those who value their dimes at the pump and/or who plan to drive their cars to 200k+ miles would benefit from the new engine design. But that’s not all! The Catalytic Converter (Cat) in your vehicle is a critical component to your emissions system, and it works to neutralize harmful gasses that are leaving your engine. However the Cat, much like engine oil, can only optimally perform once it has reached a certain temperature. The design of an integrated exhaust manifold actually allows the gases to warm the Cat faster, cutting down on the number of harmful hydrocarbons that are able to slip out the exhaust on start up. The new manifolds accomplish this through their compact design, which offers less surface area for thermal losses, and also allows the Cat to be packaged closer to the engine – giving the heat a shorter travel distance. Still not all this setup has to accomplish! Once the engine and its components are up to operating temperature, the engine controllers have another variable they need to control – exhaust temperatures. Like we mentioned before, the Cat does not function properly until it has reached its optimal operating temperature (~800° F). However, it is possible for the Cat to overheat and melt its internals; and replacing a Catalytic Converter can be very costly. Traditionally, the method used by the computer to manage exhaust temperatures was to run a ‘rich’ mixture of gasoline to air but the new integrated exhaust manifold eliminates the need for this – like we mentioned earlier there are coolant sleeves that absorb heat into the engine’s cooling system. The design numbers estimate that the exhaust can be cooled by 180° F once the engine is at operating temperature. This means there won’t be a need to dump extra fuel in the combustion chamber to mitigate exhaust temperature, and the result is about 20% better fuel economy during highway cruising. In summary, what they’ve done is combined two parts, shaved off a couple minutes during factory assembly, provided reductions in hardware and weight, reduced untreated smog at warmup, cut back the need for “rich” fuel mixtures during heavy loads, and shortened engine warm-up periods during cold starts. But the question most readers are probably anticipating – will there be any performance increases noticeable to the driver? Probably not, apart from quicker cabin heat on cold mornings. However, for the car enthusiasts (much like ourselves) who geek over industry design and engineering – this has been, and will continue to be, exciting to follow!